TAN - EMT Shears Scissors Bandage Paramedic EMS Supplies 7.25"
2 Gold Handle Assorted Iris Micro Dissecting Scissors Straight Curved 4.5"
High Quality Stainless Steel Iris Micro Scissors Curved Tip 4.5"
12 Lightweight Bandage Scissors 5.5". We have all the colors you see in the photo. 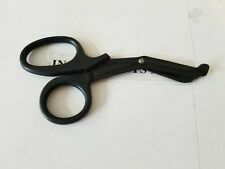 1 Full Black EMT Shear Scissors Bandage 5.5". It is easy for us to fix any problem you may have with our products or services. The Lister scissors and bandage scissors are sharp and durable with the ability to cut through multiple layers of clothing or bandages. They are sharp with a blunted tip to prevent the patient from being poked or sliced by the scissors. 2 Iris Scissors 4.5" Curved & Straight. FEATURED PRODUCTS. 12 EMT Shears (Scissors) Bandage Paramedic EMS Supplies 7.25"
12 (Twelve) EMT Shears 7.25". Dwyer Photophilic Pressure Switch / Gauge Series 3000 NIB. FEATURED PRODUCTS. 12 (Twelve) Iris Scissors 4.50" - Straight. FEATURED PRODUCTS. 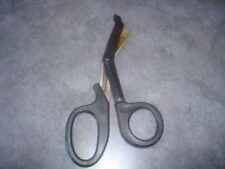 3 Lister Bandage Scissors 5.5". Stainless Steel. FULL Tactical Black EMT Shears Scissors Bandage Paramedic EMS Supplies 7.25"
EMT Shears 7.25" Full Black (Tactical Black). Dwyer Photophilic Pressure Switch / Gauge Series 3000 NIB. 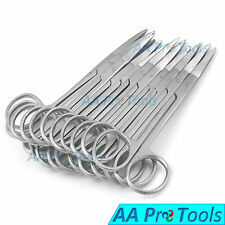 6 Pairs Paramedic Emt Trauma Shears Scissors First Aid 5.5"
PRODUCT DETAIL : 1 GERMAN PREMIUM CASTROVIEJO MICRO SURGERY SCISSORS 6" CURVED W/ GOLD HANDLE. 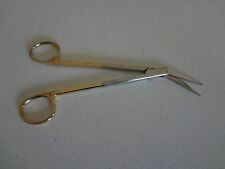 1 GERMAN PREMIUM CASTROVIEJO MICRO SURGERY SCISSORS 6" CURVED W/ GOLD HANDLE. In addition Surgical Pros Incorporation is accredited toCE, ISO 9001, ISO 13485, and FDA. Product Conforms to ISO 9001, CE-Quality Mark, ISO 13485, FDA and other Quality Standards. Ultrasonic Cleaned. Our products are trusted by thousands of doctors worldwide. In addition Surgical Pros Incorporation is accredited toCE, ISO 9001, ISO 13485, and Other. Non Slip Grip Premium Quality Handle. High Degree of Precision and Flexibility while conducting the Clinical Procedure. "The sale of this item may be subject to regulation by the U.S. Food and Drug Administration and state and local regulatory agencies. CARE FOR YOUR HEALTH. CHOOSE THE DEAL AND COMPARE PRICES. Great for teams, tactical applications. The scissors is made of stainless and blades are straight. They have specialized structures for specific procedures. Surgical scissors designed for cutting delicate tissue. They are constructed of stainless steel. My wife & I are ER people and use trauma shears daily. We got these and couldn't be happier; Very bright, keep their edge, lightweight, comfortable handles, and rugged. The only issue is that they're so perfect, everyone wants to 'borrow' them, because of their's stink, and our great shears. CH2096 VITAL MAYO DISSECTING 9" CURVED QTY 1. CH2095 MAYO-HARRINGTON DISSECTING SCISSORS. CH2053 COOLEY "MY SCISSOR" 9" CURVED QTY 2. 6 V MUELLER VASCULAR SCISSORS. 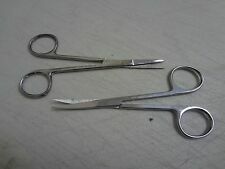 3 EMT Scissors Surgical Medical Veterinary First Aid 5.5" 5.50"
3 (Three) EMT Shears. Always Best Quality! Our production process has attained ISO 9001:2008, ISO 13485:2003 certification, cGMP compliant and CE certification. MAIN PRODUCTCATEGORIES. DETAILS &POLICIES. Dental Crown Curved Scissors 4.5": Crown Scissors are most commonly used for restorative procedures such as cutting dental dam material, retraction cord and stainless steel crowns. Our products are trusted by thousands of doctors worldwide. We can match or beat all of our competitors prices. SURGI SALES. 7 V MUELLER OP5525. VITAL KNAPP IRIS SCISSORS. THE ITEM(s) IN PHOTO ARE ACTUAL ITEM(s) YOU WILL RECEIVE. 100 EMT Shears 5.5". 10 Different Color Handles. Two Pieces Yasargil Bayonet Micro Scissors Set Includes Yasargil Micro Scissors Upward Curved 7.5" Sharp/Sharp, Working End 2.5 cm, Net Weight is 1.27 oz. Yasargil Micro Scissors Straight 7.5" Sharp/Sharp, Working End 2.5 cm, Net Weight is 1.30 oz. 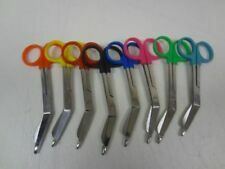 6 pcs PARAMEDIC EMT TRAUMA SHEARS SCISSORS Utility Scissors 5.5"
6 Pc EMT Bandage Scissor 5.5" Multi Colors - NOTE COLORS WILL BE RANDOM. "The sale of this item may be subject to regulation by the U.S. Food and Drug Administration and state and local regulatory agencies. 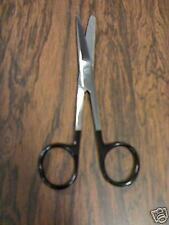 2 SuperCut Iris Scissors 4.5" Curved & Straight. German Stainless Steel CE Surgical. German Stainless Steel CE Marked. 1 Pink EMT Shear Scissors Bandage 7.5". 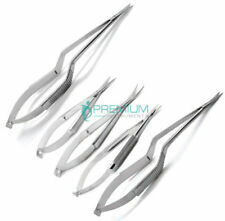 HIGH QUALITY STAINLESS STEEL SUTURE STITCH SCISSORS STRAIGHT TIP 4.5"
6 PAIRS TRAUMA SHEARS BANDAGE SCISSORS 5.5". R GRADE MAYO DISSECTING SURGICAL VETERINARY SCISSORS STRAIGHT WITH GOLD HANDLE 6.75". R GRADE SURGICAL STAINLESS STEEL. UNLTRASONIC CLEANED. Manufactured from AISI 420 Premium Quality stainless steel. Always Best Quality! Our production process has attained ISO 9001:2008, ISO 13485:2003 certification, cGMP compliant and CE certification. OUR PRODUCT RANGE. Highest Quality & Economical prices. HIGHEST PRODUCT QUALITY. 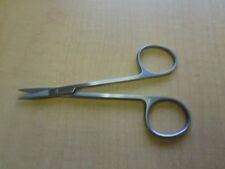 NEW GERMAN 2 EA Surgical Operating Medical Mayo Scissors STRAIGHT +CURVED 6.75"
AVON SURGICAL. EXCELLENT QUALITY 1EACH GERMAN STAINLESS STEEL. TYPE: O.R GRADE GERMAN STAINLESS STEEL. •Usage : Left Hand or Right Hand. · We Try Our Best To Describe The Products As Accurate As Possible. 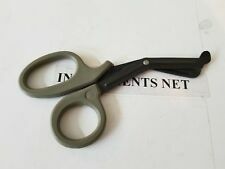 1 Black EMT Shear Scissors Bandage 7.5". It is easy for us to fix any problem you may have with our products or services. JARIT SUPERCUT DIETHRICH ARTERY SCISSORS. 102-350 25 DEGREE 7". "The sale of this item may be subject to regulation by the U.S. Food and Drug Administration and state and local regulatory agencies. "The sale of this item may be subject to regulation by the U.S. Food and Drug Administration and state and local regulatory agencies. EXCELLENT QUALITY OF. 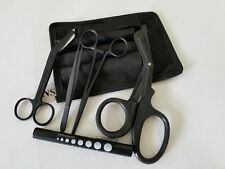 4.5 out of 5 stars - FULL TACTICAL BLACK EMT Shears Scissors Bandage Paramedic EMS Supplies 7.25"
14 product ratings14 product ratings - FULL TACTICAL BLACK EMT Shears Scissors Bandage Paramedic EMS Supplies 7.25"
Length:13 cm Double Curved. "The Sale of this Item may be subject to Regulation by the U.S. Food and Drug Administration and state and local regulatory agencies. ~ 1 PC HIGH GRADE SUPERCUT IRIS MICRO SCISSORS 4.5" CURVED STAINLESS STEEL BLUE. Medical Bandage Scissors Nurse Shears Trauma Tools Surgical Doctor Black 7.5 In.